Biocell Water remote work camp container plants offer a perfect solution for temporary or mobile wastewater treatment applications and are particularly suitable for applications such as work camps, drilling rigs, military camps and construction sites. A mobile sewage system presents the best wastewater treatment solution in remote locations where there is no existing sewerage . It can be relocated to a new site or re-positioned on an existing site as the need arises. The systems are delivered to site ready for immediate use and operation is fully automatic. Biocell remote work camp wastewater treatment systems are ready made solutions, with all of the components preinstalled within ISO sea containers to achieve any effluent target. All of our systems meet international standards with regard to safety, quality and effluent discharge. We can also offer add on modules to disinfect the wastewater allowing it to be reused for irrigation. For larger applications we can also offer membrane ultra filtration and reverse osmosis systems to produce potable water from the recycled wastewater. 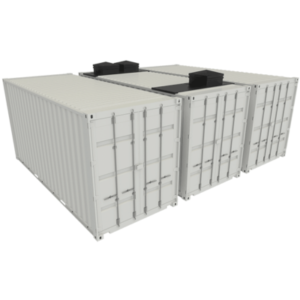 These add on containerized filtration units are also mobile and portable. How do Container Plants Work? Screening. Screens prevent large solids and inorganics from entering the wastewater treatment plant. For larger applications, we can supply a mechanical screen for larger flowrates. For smaller applications a we can supply a manual screen. Buffering. A buffer tank will equalise the incoming flows of wastewater to the mobile wastewater treatment plant. This prevents the system becoming overloaded during periods of peak wastewater flow. Biological treatment. Biomass develops within the systems and degrades contaminants within the wastewater. Our container plants operate based on the fixed bed process. The fixed bed process for containerised wastewater treatment systems is superior to SBR, membrane, MBBR and other technologies. It is more reliable, and provides a very safe and efficient method of wastewater treatment. Clarification. High flow capacity final clarification of the effluent is via the use of lamella separators built into the portable wastewater containers. These provide a final degree of treatment prior to effluent discharge, with optional disinfection after this. Get in touch if you would like to purchase a packaged treatment plant for treating wastewater at a remote work camp or any similar application. A member of our technical sales team can provide any additional information you require and we offer a free quotation and design proposal on all queries for large scale wastewater treatment solutions. Our plants are available to rent or buy with additional finance options. 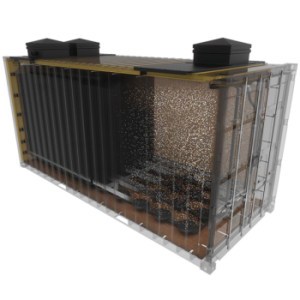 Our sewage treatment container plants are a fully automatic solution delivered to site ready for use. This makes them ideal for military camps, mobile and temporary applications, remote work camps and construction sites. Very satisfied with our dealings with Biocell. Excellent all round solution for an offshore facility. Biocell Water offered the best design proposal and price.